a Landcruiser complete with rooftop penthouse and garden patio just steps from the side door, the Camel is all dressed up with her decals and ready to stroll into the container, and settle down for the long ocean voyage and she is glad to have Max as company in the container. Erna and Karl Rosch with Max. A Mercedes 290 GD Turbo (Gelaendewagen) well equipped with extra fuel and water tanks ready to challenge whatever gets thrown our way. A new rooftop tent a new fridge the emphasis on easy access and handling. This will be our first extended trip with Max, however we have been on other tours with our previous G Wagen Charly We always rely on a G Wagen. We rolled one and almost burnt out another but still a G Wagen it has to be for the two of us. The Sahara Stallion (actually a 2006 Mitsubishi Clubcab) has upgraded suspension, top of the range aluminium canopy and a clever double slide drawer arrangement at the back for easy access to food, camping equipment and cookers. It has only 15000 kms on the clock, has just been serviced and has been doing light duty for Monsoon Irrigation over the last year. It is a 2,8 diesel, with intercooler and turbo. It cannot wait to show the way to the other vehicles next month. 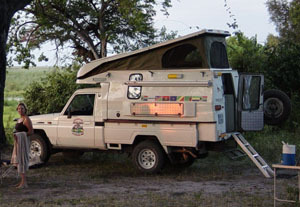 Our diesel Landcruiser LDV 4.2 L is the vehicle we have chosen for our African adventures. This is a reliable Toyota motor which is most commonly used in Africa. Spares and mechanical knowledge, if required, are therefore easily available anywhere in Africa. It is not a fast vehicle, but is a work horse. We have added a Radical Top fibreglass camper on the back. 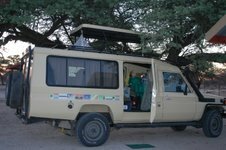 This camper allows us to be totally self contained inside the vehicle which is useful in bad weather and in areas where wild animals enter the camping area. The roof lifts by approximately one metre at the back and is hinged in front. We sleep in a double bed in the raised area with our feet facing the front of the vehicle where there is less height and our heads in the higher rear area. There are also built in cupboards for all our accessories and food and water containers. We have a built in stove, sink and fridge. The usual extras include winch, 189L petrol capacity, 100L water tank, deep cycle 2nd battery and solar panel power system. The vehicle has previously travelled through Angola, DRC, Congo and Gabon without any mishaps. We are looking forward to testing it in the Sahara. Jurassic purchased in 2002 and the conversion was completed in Windhoek. The vehicle is based on a Mercedes Sprinter delivery van with an Iglhaut 4x4 conversion. Iglhaut is a German company allied to Mercedes and is now authorized by them to carry out these conversions The vehicle has a permanent 4x4 drive [similar to a Land Rover] with a High/Low transfer case and 3 diff locks. The offroad capabilities are excellent with very good entry and departure angles. The downside with the conversion is that the original front suspension [Single front transverse front spring] is retained and this is unfortunately not strong enough to withstand some of the heavy offroad work. The rear suspension has proved adequate although I have fitted airbags to complement the back shocks. The interior was fitted out in Cape Town and contains adequate packing space with a working galley and microwave and also an interior toilet and shower cubicle. The couch converts into a double bed and because of the delivery van body there is no division between the driving compartment and the rest of the vehicle. The rear section contains a full work area where all the spares and working items are kept. This area also contains the gas supply as well as a small generator that can supply AC power. The vehicle is also fitted with 2 air conditioning Systems one driven by the vehicle engine and the other by 12v battery. 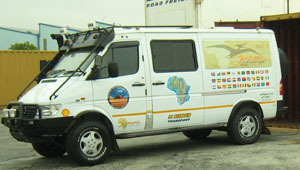 Jurassic has now completed over 70000 km all across Africa including a trip from Cape to Cairo and back.